Has Your Meade ETX Telescope got a mind of it's own? Does it always point the wrong way? Put yourself in control with a 10 easy step guide to master your ETX and Autostar! for you to try again or put it on Ebay! Imagine how it was when I bought my very first ETX home and rushed outside on the first clear night and with so much excitement, my family even came to take a look, as I extolled the virtues of this first computer driven telescope –“ the future of astronomy” I said! Bear in mind that I sell telescopes for a living and so my family is quite used to my enthusiasm and they also are aware that I do know one end of a telescope from the other. With that, I pressed the buttons and the scope whirred into life and started moving around! Cheers from the onlookers and I stood there grinning delightedly. However, when it stopped moving it was pointing in completely the wrong direction and the cheers turned to hoots of laughter from my children and dark mutterings about boys toys from my wife! Well, by the time we had the next clear night, I had read and re-read the manual, and out we all trooped! This time the scope whirred and moved and we all waited with bated breath and… you guessed it!I have never lived it down – “ call yourself an astronomer Dad?” That did it! I wasn’t going to let this machine make a fool out of me. By the third time I set it up, I had it all sorted and my evening’s viewing was fantastic – but lonely – the rest of my family had lost interest! Since then I have discovered that my experience is quite common and so I decided it was time to write a simple step by step guide to ensure future Meade ETX owners skip all the frustration and get going quickly and easily. So what are my credentials? A lifetime as an amateur astronomer, over 10 years in telescope retail, and I am a Fellow of the Royal Astronomical Society and the equipment expert on the BBC Sky at Night Magazine. I also run a night-class at my local planetarium, so you can be assured that I’ll explain it all simply and easily. lessons, what I learnt the hard way! So come with me on a step-by step guide as you learn everything from setting up to turning your ETX into a robotic observatory. I’ll put you back in control of your telescope so that you will be using it like a professional! In clear simple and practical steps you will learn all you need to master the system and save yourself time and frustration! Easy to read and packed with pictures! 15 minutes in the daylight that could save you hours of frustration at night! You have already spent hundreds of pounds on your ETX and now for the cost of considerably less than a new eyepiece you can have this amazing e-book to tell you how to get started quickly and easily with your Meade ETX telescope. For only £17.00 you can download your e-book immediately and you are on the way to becoming a Meade ETX expert, effortlessly and easily! "Your ETX in 10 Easy Steps" is great! To the point and easy to understand, it is exactly what I had been looking for to get the most out of my ETX-90. I wish a copy had been included with the telescope when I bought it. You've done an excellent job and Meade should have you writing their manuals. 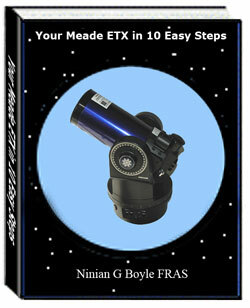 Your Meade ETX in 10 Easy Steps is excellent for the beginner. I am new to astronomy and have a new ETX-80. I found your book a perfect complement to what came with the telescope. Everything was explained well and easily understood. ...Overall, I think this is the best step by step beginner's guide that I have come across, why didn't you write it a year ago!!! Bonus #1: A free report enabling you to understand and deal with dew on you telescope that can impede your view! Bonus #2: Insider tips to ensure you get a perfect focus every time! Try the book RISK FREE for 6 months! I am so confident that you will find this book useful and that it will teach you so much to ensure you have many productive hours of observing with your Meade ETX that I am prepared to offer you a FULL MONEY BACK GUARANTEE for 6 whole months! That’s right, you have 6 months to read and evaluate the book and if at the end of that time you can honestly tell me that you have not learnt anything useful I will give you your money back in full and close the book, no quibbles! Start Reading Your Ebook Now! Claim your copy of Your Meade ETX in 10 Easy Steps Ebook now along with your two free bonus reports for the fantastically low price of only £17.00 , and in the next 5 minutes you will be on your way to becoming a Meade ETX Expert! Please note: The e-Book Your Meade ETX in 10 Easy Steps is protected PDF which you can open and read online or download..